Gorgeous Gothic necklace - a dark and Delphic romance of the heart expressed in a blue enameled heart bracketed by skulls and a sparkling crystal drop. An assignation between two strange and exotic creatures from another place, amorous beneath the stars in the night sky. 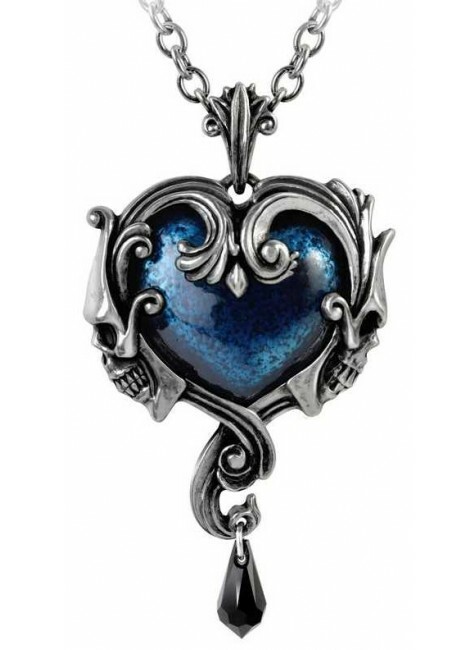 A large pewter heart pendant, the center piece enameled in a transparent midnight blue and surrounded by an antiqued pewter Baroque frame with a skull profile on either side. A black Swarovski crystal teardrop is suspended below the pendant which hangs from a pewter bale on a 32 inch silvertone long chain. Item Number: AG-P792 | Approximate Size (Inches): 1.69 wide x 0.55 deep x 3.03 high | Approximate Shipping Weight: 1.00 lbs. Blood red Swaroski Crystals dangle from post heart earrings with another.. Perfect as a Gothic engagement or wedding ring, gorgeous gothic scrol..